Gott Heart Art: Summer Time! Wow Whew--I have to start off this post with clapping myself--Samantha over at SP Color Combos found my blog last week and invited me over to her challenge blog, sooo, I just had to enter and low and behold I got picked as one of the top 10 winners. Thanks-Samantha! Will add my blinkie prize latter this evening. Now on to my a summer time card. These are challenges and for some reason I've had a hard time coming up with some cute summer time cards, but today, after much contemplation, I think it's kind of cute. On top of the outside cuteness, the little ditty on the inside I made up, so I signed my name to it. I just love this set of stamps from Stampin Up I find myself using them quite a bit, very versatile. These challenges have also been very good for me because it has caused me to really get into allll my stash and do some organizing and reorganizing and actually use some things I've been hoarding, but we all know that will only make room for more new stuff, birthday and Christmas on the way. I'm practicing with my anniversary photo box, these are my 2nd and 3rd photos, hope to improve with time. Supplies: Card Blank: Yellow 5 1/4" X 7 1/4"-The Paper Co. Value Pack Hobby Lobby, white textured card stock, yellow card stock, back ground paper-Paper Symphony Crafters Block II-Seasons and Holidays, Stamps: Stampin Up-Stardust, Ink: CTMH-Z2162 Honey, CTMH marker-sunny yellow, ribbon-Hobby Lobby, printed my poem in Printmaster 11, pop dots. Beautiful, bright card!!! Thanks for joining us at Rosie-Dee's!! Super fun card! I love the bright colors and such a clever saying! A great fun card - love it. Thanks for sharing it with us at the PInk Elephant. oooo this is stunning!!! I love all the colours & your sun is superb! 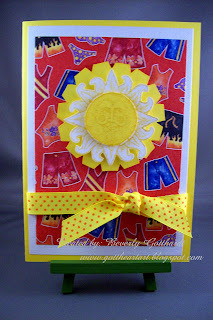 Great bright and summery card Beverly, love how did the inside too! Thanks for joining us this week at TPE. Hi Beverly :) LOVE your card and the fun summer design!! What a wonderful design on the inside of the card, great job! What a great Fun and Cheery Card!! So happy you joined us this week at The Pink Elephant!! 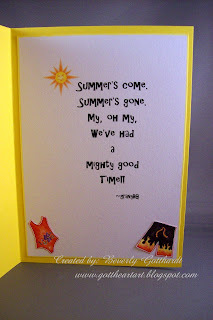 What a lovely summer card, so bright and vibrant and nice sentiment. Thanbk you for joining us at Rosie Dees this week. Bright and beautiful... thanks for playing along with rosiedees this week. Gorgeous card. Thanks for joining us this week on Rosie~Dee's challenge. Gez. love the sun idea instead of the flower!!! Thanks for playing with us at Stamps and Smiles and remember this week's sketch is up! Come and play with us again! Very cute card!! Thanks for playing along with us this week at TPE! !